Panic of 1837: Martin Van Buren was the 8th American President who served in office from March 4, 1837 to March 4, 1841. One of the important events during his presidency was the Panic of 1837. Summary and definition: The Panic of 1837 was a crisis in financial and economic conditions in the nation following changes in the banking system initiated by President Andrew Jackson and his Specie Circular that effectively dried up credit. Other causes of the Panic of 1837 included the failure of the wheat crop, a financial crisis and depression in Great Britain that led to restrictive lending policies. President Martin Van Buren was blamed for the Panic of 1837 and proposed the system for the retaining government funds in the United States Treasury and its sub-treasuries to address the situation but met with strong opposition by the Whigs, led by Henry Clay. The Panic of 1837 occured just 5 weeks into the presidency of Martin Van Buren. The events leading to the Panic of 1837 took place during President Andrew Jackson's term of office, and even before his presidency. The earlier Panic of 1819 was caused by the bad management of the Second Bank of the United States and had resulted in serious hardship for the people in the two year depression that followed. Andrew Jackson, the 'man of the people', had also suffered financially during the Panic of 1819. The experiences suffered by so many American citizens, including Andrew Jackson, fostered a profound mistrust of banks, bankers and paper money. When Jackson became president he swore to bring about the destruction of the Second Bank of the United States and so the Bank War began and the national bank was destroyed. Government money was deposited into Jackson's state "Pet Banks". Unregulated Wildcat banks also emerged, especially in the frontier towns of the west, where there was extensive land speculation. The Wildcat Banks were not backed by specie (meaning gold and silver) and distributed practically worthless currency backed by questionable securities. There were massive amounts of banknotes in circulation without deposits, or gold or silver to cover them. Andrew Jackson issued the Specie Circular at the end of his presidency to end reckless land speculation. The Specie Circular demanded that payments for the purchase of public lands were made exclusively in gold or silver. It also dried up credit, leading to the Panic of 1837. Just to add to the financial and economic crisis of the nation the 1836 wheat crop had failed causing hardship for the northern farmers in 1837. The South also suffered because there was a depression in Great Britain and the sale of cotton dropped dramatically. The British depression led to restrictive lending policies by Great Britain that curtailed the flow of money and credit to the United States. The Second Bank had been closed. The government had paid their debts. The government needed a plan to distribute surplus government money - it had to be stored somewhere. The plan was to loan the surplus revenues to the states in proportion to their electoral votes - three payments were made to the states. The Deposit and Distribution Act of 1836 placed federal revenues in various banks across the nation. Martin Van Buren and the Panic of 1837: "What should be done with the government's money?" 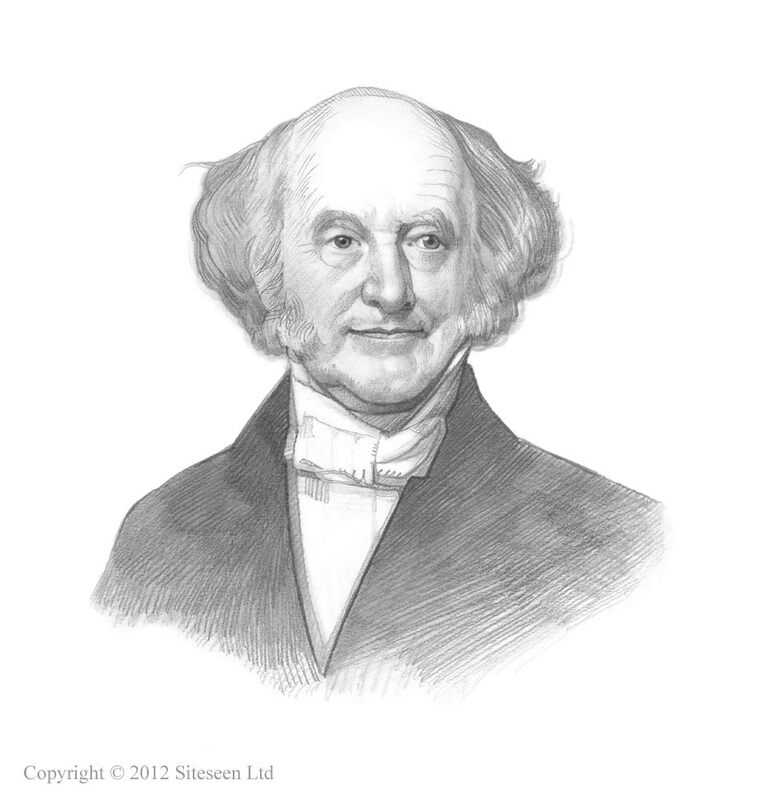 President Van Buren was faced with finding ways to resolve the financial crisis. The immediate question to be answered was "What should be done with the government's money?" There was considerable opposition to the idea of the treasury. The Independent Treasury Act was passed by Congress in 1840 but there were many requirements to put the plan into effect and before the Treasury system was in full working order Martin Van Buren was no longer President and the nickname 'Martin Van Ruin' stuck. In 1841 the Whigs, who wanted a new central bank, repealed the law. The Whigs plans to establish a new central bank failed due to a veto by President John Tyler on constitutional grounds. The Democrats won the election of 1844 and re-established the Independent Treasury System in 1846 in the Independent Treasury Act of August 1846 during the presidency of James Polk. The Panic of 1837 was one of a series of financial crisis to cripple the economy of the United States - refer to the Panic of 1819, the Bank War and the Panic of 1857 for additional facts and information.